Halloween is a holiday where mischief and magic are celebrated and pranksters. It is also a day where we dance along the line between good and evil, usually in the sense of juvenile pranks and lustful trysts. It is often during days like these where we tend to forget that there are still people out there who have not only danced on that line, but have jumped across it. 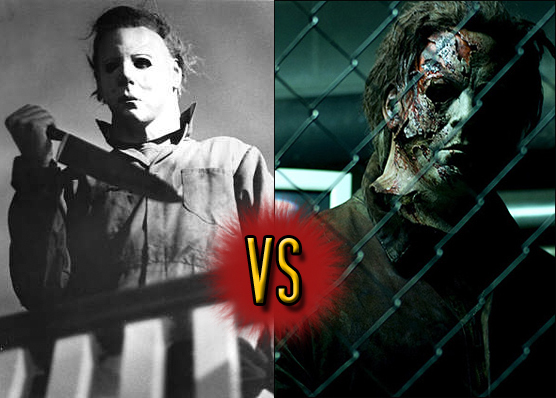 In our final Monster Clash of the season, our contenders are two versions of “Halloween.” The first is the original 1978 film directed by John Carpenter, and the second is the 2007 remake by Rob Zombie. [1978 version] Things in this film are established quickly. We immediately get a feel for the town and environment this film is set, which is essentially a modern suburb by 1970’s standards. The suspenseful elements are built up slowly, with most of the “graphic” elements being saved for the third act. The film’s small budget does shine through at certain spots, such as the limited sets and occasional audio hiccups, but it makes up for it with the slowly paced handheld shots and a few clever editing tricks, proving that it’s possible to make so much out of so little. [2007 version] This is one of those films that just feels long. The setting is established quickly like the first film, but it’s plagued by the many modern pitfalls such as handheld shaky-cam, and pointless tilted angles. It does an okay job with certain elements like the masks Michael makes during his incarceration and certain lighting effects and shots, but a lot of the added gore just makes it too over the top. The music is hit-and-miss, with some moments working pretty well, while others are kind of “meh.” They used the Halloween theme way too early and at points where it just doesn’t work. [1978 version] When you really break it down, this film can be seen as a fairly simple story, even something that you’d mostly see in crime dramas rather than a feature film by today’s standards. The characters are simple and are quickly established through their banter and not through an expositional onslaught, save for the occasional cryptic lines from Loomis, played by Don Pleasance. All in all, it’s like what the found footage films of today try to achieve except it’s delivered to us in a simple and easy fashion. You don’t learn much about Loomis, or Michael Myers but in the case of a film like this you don’t need to. This is horror film, not a character study. [2007 version] From the get-go, this is just painful to watch. I know that we’re supposed to understand Michael’s background, but all that’s really added is a few extra killings during his childhood and his time in the mental institution. It’s a needless psychoanalysis that would be okay if that was the point of the film on it’s own as a prequel, and not intended as a remake. All it does is take over 40 minutes to show us something that could just as easily have been shown in 5-10 minutes or less. It’s not helped by a needless summation given by Loomis, this time played by Malcolm McDowell. It needlessly adds an extra heap of depravity to the whole thing with all of the characters coming across as crazy and dysfunctional (and not in the good way). It looks as if Rob Zombie tried to communicate some sort of socio-political commentary, but it would have been better if he either ended the film at Michael’s escape or just made a separate movie. This is a very one-sided battle, as I couldn’t even finish the Rob Zombie version. It made me angry and annoyed within the first ten minutes, and I could barely make it over an hour. After you get through Michael’s childhood, there’s really almost no point in watching past that because it was too much of a rehash or the original. It’s as if they copied and pasted the original script into this new version and expected it to blend well. It doesn’t. That brings this battle to a close. Have a happy and safe All Hallow’s Eve. Be sure to keep your doors locked and impromptu weapons strategically placed around the house should any monster make their way to your front door (or hallway, if you live in an apartment).